A long pagoda rising overlooking the floating world of Gion below, Yasaka-no-to Pagoda is a lovely sight by day or night. 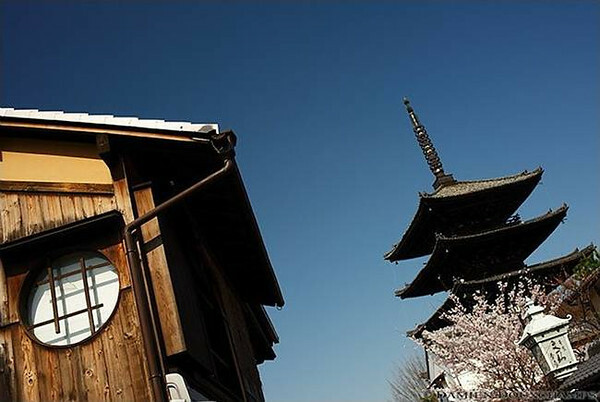 While most pagodas come complete with temples, Yasaka-no-to Pagoda stands mostly alone, the buildings of the temple of which it once belonged (Hokan-ji Temple) having been destroyed by fires, earthquakes and wars over the years. We’re thankful that the pagoda survived, because it’s a stunner. It stands at the top of Yasaka-dori, which is itself unique for the lack of overhead power lines, which were removed to preserve the view of the pagoda. The pagoda can easily be accessed from Higashioji-dori, or by ducking off of the bottom of Ninen-zaka. It’s particularly lovely after dark, especially when the lone cherry tree at the base of the pagoda is in bloom. Yasaka-no-to Pagoda is located in Kyoto’s Southern Higashiyama district. See our complete list of things to do in Southern Higashiyama, including places to eat, nightlife and places to stay.